Who, me? I am just enjoying the patio. What’s a poster child? On a recent morning, Honey, who will be 16 in a few months, went outside. Two an a half hours later she was whining and pacing about so Eldest Daughter tried to put her out again but Honey ran to her bed, her universal sign for “Don’t need to, thank you!” Thirty seconds later she piddled right there in front of us. Ironically, I had just had a conversation with some ladies about how much longer pets seem to live now than they did even 10 years ago. I guess when a dog lives a very long time they have to deal with the very same issues humans have to deal with – pain, hearing loss, eyesight problems and dementia. One bright spot is that everything online mentions that, unlike humans, dogs don’t seem to be too terribly perturbed about, well, losing their mind. After all, long chess games, good books, and vigorous conversation about world problems are not something they do. We were pleased to read that. Honey has also developed some arthritis in her elbows. We were giving her pain medication, but it requires regular liver function tests. 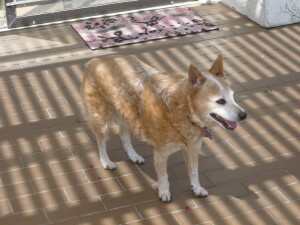 Then, on the recommendation of an acquaintance, we began feeding Honey a “joint health” dog food. That has worked really well and she no longer needs the pain medicine. As for her hearing and eyesight, well, nothing we can do there but she gets along fine. As for the rest of it, we do put her ot a lot more often and that takes care of most of the problems. Sometimes it doesn’t, so we clean it up. We may not like it, but that is the least we can do for our dear, dysfunctional furry family member. I’m so glad to hear that Honey has very patient family members. I am not sure how patient we are, but we put up with it for her sake. I remember those days with my old cat Jake. Jake developed night terrors. He would wake up in the middle of the night disoriented. He couldn’t see very well or hear and would cry. I would have to get up to comfort him. It was so sad for me to see. The piddles are easy to clean. Some of the other symptoms get heart wrenching. Good luck with Honey. You are good pawrents… I can tell. And I can tell how much love is there too.